This year at The Pub Club we have been focusing on one of the most important aspects of doing science – Communication. 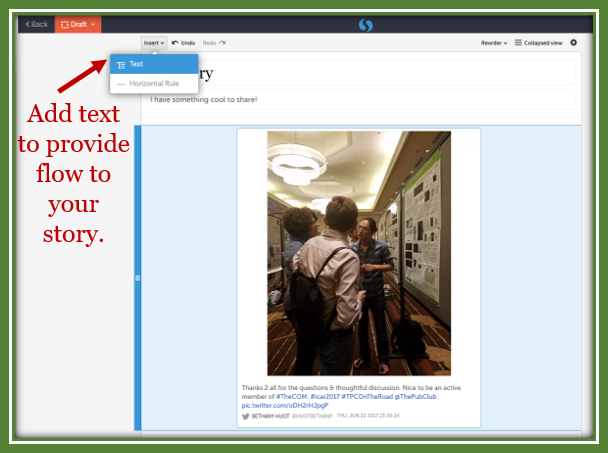 This post will introduce you to Storify, and provide examples and tips regarding its use as a tool to share your science as a story. What is Storify & How does it work? Storify is a platform that enables the user to create a story or timeline by combining and organizing elements from various social media sources, such as Twitter, Facebook and Instagram. To create a story, you must first create a free account, or simply sign up using an existing Facebook or Twitter account. Once logged in, select “New Story” and you will see the screen shown in the picture below. The right hand column provides a list of online content options, including Twitter, Instagram, Facebook, YouTube, Flickr, Tumblr, Google among others. Simply choose one, search for the content you want, and then drag and drop the content into the left hand column where your story is being created. You can use as many of the options as you like to find content for your story, and can also embed URLs to posts or other online content that may be relevant to your story. Note: Choose the first image or content that contains an image carefully as it will become your title image. While working on your story, you may want to move items around to optimize flow. This can be done by simply grabbing the content and dragging it up or down. 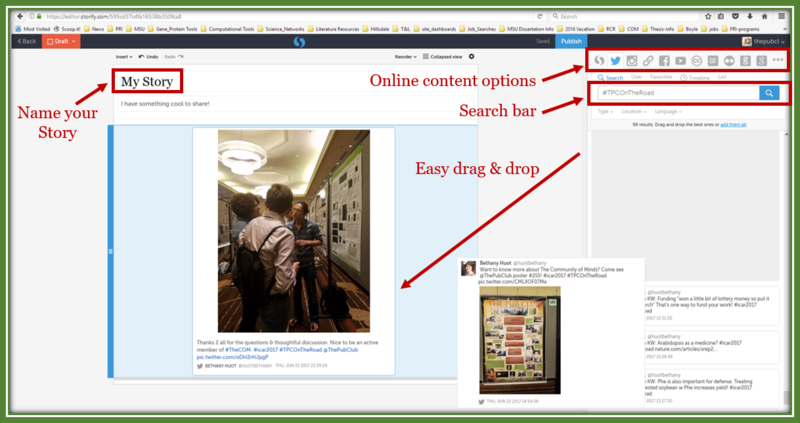 Once you are finished, you can view your Storify to assess it for content and flow. Remember, you are trying to tell a story, so ask yourself if the message you want to convey is clear based on the content and order you have used. Once you are happy with it, Publish your Storify. You will be prompted to Share your story when you publish, and also to Notify those whose content you have used. These are both highly recommended, as the whole purpose in creating a story is to share it with others! Be aware that the default setting for Notifications is to select only the first person in the list (noted by a green check mark). To notify everyone, click on each person in the list, and verify they each have a green check mark. Create an account or sign up using an existing Facebook or Twitter account. Select “New Story” to get started. Give your Story a catchy title. You may also add a subtitle to provide more context. Find online content relevant to your story by selecting one of the options and then searching for content using the search bar. Choose first drag and drop image carefully. Drag and drop desired content into your story where it fits best. Remember if you decide something would fit better two places up, simply grab it with your cursor and drag it up. Add text to provide flow and context to your story. Read through your Storify to be sure it tells the story you want in the way you want to tell it. If your story is right… PUBLISH! When you publish you will be able to “Notify” those you included in your Storify, which will help get it out to the Community. Note: be sure to select everyone you want to notify, which is indicated with a green check mark (default is only one). Finally, click on your Storify, click on the various “Share” buttons and spread your story. Create a new story for each day of the meeting to make each Story a manageable length. Provide Headings that separate and clearly label Plenary & Concurrent Sessions to help guide your reader. Separate out Tweets regarding posters, informational booths, workshops or social happenings. These are best placed at the beginning of your story, during breaks (labeled as such) or at the end of the story. 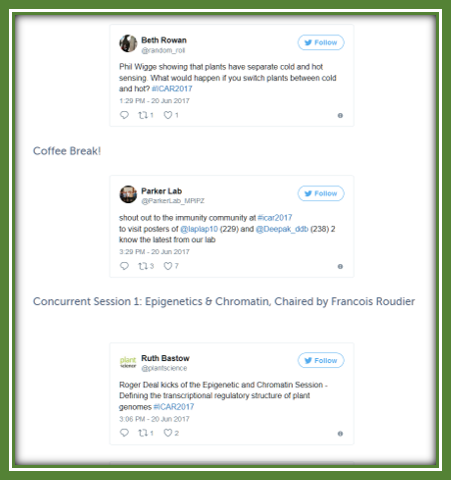 I like to put some in each place to show the Community and help provide a human element to all the science being shared! Select Tweets for each talk that provide breadth of perspective (multiple Tweeters) while avoiding redundancy. This means you probably won’t use ALL the Tweets, especially at meetings with many active Live-Tweeters! As pointed out in Tweetiquette, pay attention to quotes being accredited to the speaker versus a listener’s opinion. Use the second conservatively and only if they are clear it is their opinion. Don’t worry about the time stamps as they show the time the Tweeter (who may be a novice) publishes the Tweet, NOT the time the speaker says it! The whole point of Storify is to tell a story, so put the Tweets/content in the order that highlights the message. Track your Storifies by going to “My Stories” where you can see how many “views” your story has. Well that’s it! 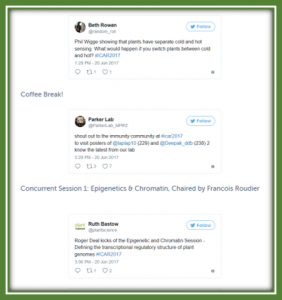 Storify offers an opportunity to not only communicate our science, but to develop the many skills necessary to better communicate in various formats to diverse audiences. So… get started!